Gambling can be defined as playing a game of chance for stakes. Gambling occurs in many forms, most commonly 4D, TOTO, lotteries, casinos (slot machines, table games), bookmaking (sports and horse racing), card rooms, bingo and the stock market. Gambling disorder is sometimes referred to as the "hidden illness" because there are no obvious physical signs or symptoms like there are in drug or alcohol use disorder. It devastates not only the gambler but everyone with whom he or she has a significant relationship. 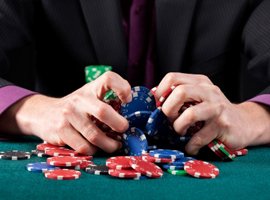 It is the inability to resist impulses to gamble, leading to significant personal, family and occupational difficulties. When a problem gambler is on a winning streak, he lavish gifts on himself and others. You might receive unexpected treats and gifts. He attributes his winning to his ability or being lucky. There is a sense of invincibility which lead to betting in larger amounts or making risker bets. He starts to move into the losing streak. Instead of stopping, he "chases losses". During this period of chasing losses, the sole intent is to win back the money at all cost. Often, this tunnel vision resulted in a deeper debt. He will stop gambling after emptying out his personal savings and maxing out on debts (family, friends, legal & illegal). Although many problem gamblers may 'chase' for a short period of time, it is the frequent, and long-term, "chase" that is characteristic of gambling disorder. A problem gambler, in heavy debt, would be constantly thinking of ways to recoup his losses. His solution is to gamble. As a last resort, He asks his family and friends for 'bailouts' when the debtors appear at his home and / or office. He often understates the actual amount of debt out of shame or to reduce the perceived severity of the debt problem. After bailing out, family and friends assume that the debt problem is settled. Unknown to them, there are some unaccounted debts / debtors. This secrecy is one major risk factor for relapse. Often triggered by stress to pay back debtors secretly, the problem gambler resort back to gambling, for quick cash, and which cause more debts. The vicious cycle of chasing losses repeats itself. If you find yourself chasing losses, seeking professional help early can help to reduce the harmful consequences and social & economic costs of problem gambling. Screening - The aim of the initial session is to identify the presence of gambling problems and/or effect of negative consequences of problem gambling. Any other existing mental health conditions are screened for in order to provide a deeper understanding of the client. Assessment - This is a comprehensive understanding of the severity and depth of the problem gambling in the context of the client life's situation. The individual's strengths, weaknesses, problems and needs are accounted in order to collaborate an effective solution. A discussion of potential risks is also integrated into the treatment planning. Treatment Planning + Counselling - The treatment plan is tailored to the client's needs. Immediate and long-term goals are established. A discussion of WE CARE's holistic services is included in the treatment planning. Brief therapy is provided to problem gamblers. For compulsive gamblers, an intensive and long-term recovery approach is more appropriate. G.R.I.P. 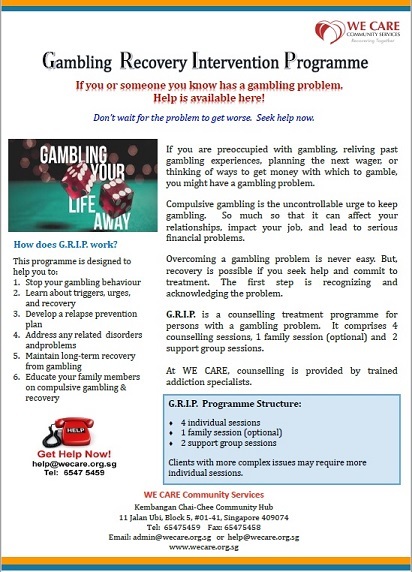 is a counselling treatment programme for persons with a gambling problem. The programme involves the individual, as well as the family members, in counselling and self-help groups.